Opening: February 24, 2005, 8 p.m.
March 3, 2005 at 7, 8 & 9 p.m.
October 7, 2005, 6 p.m.
For the upper hall of the Neue Nationalgalerie, visual artist and musician Carsten Nicolai has conceived of a mobile space that serves as acoustic body, resonating space and projection surface all at once – a crystalline architectural body whose translucent skin is the vehicle for both acoustic and optical events. 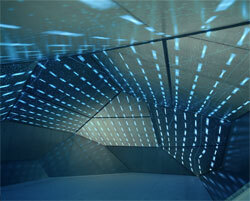 Electronic music composed by Nicolai generates modulations in laser-projected light. 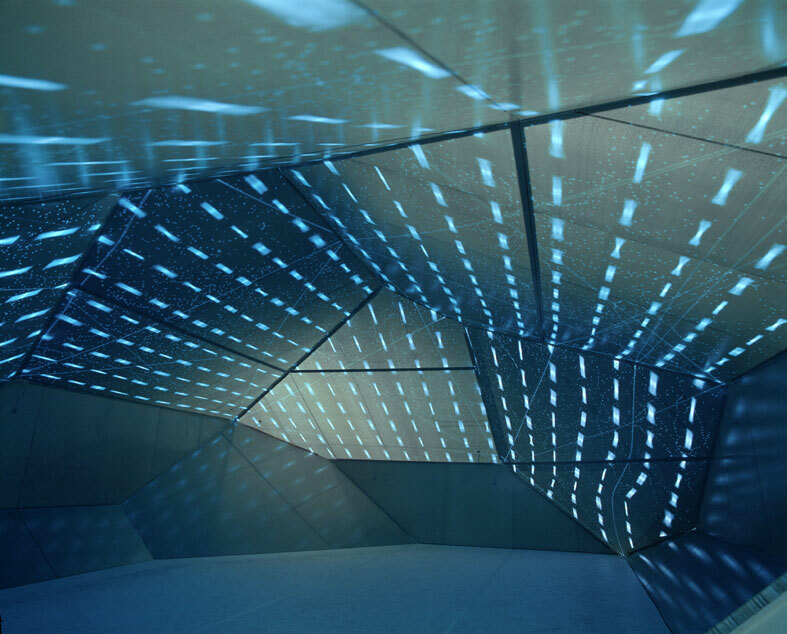 The composition, designed to run for the duration of the installation, is planned for daytime and nighttime conditions as well as potential live presentations. 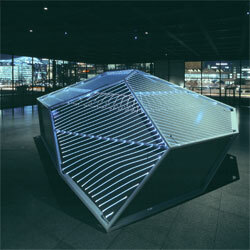 The architectural body is a sound and light space that visitors can enter into, or they can also perceive it from the outside, even at a distance. This mobile architecture is a prototype that the artist has developed together with architects Finn Geipel and Giulia Andi, LIN as well as with engineer Werner Sobek. Along with the latest in laser technology, Nicolai experiments with the special acoustic conditions of the crystalline space. 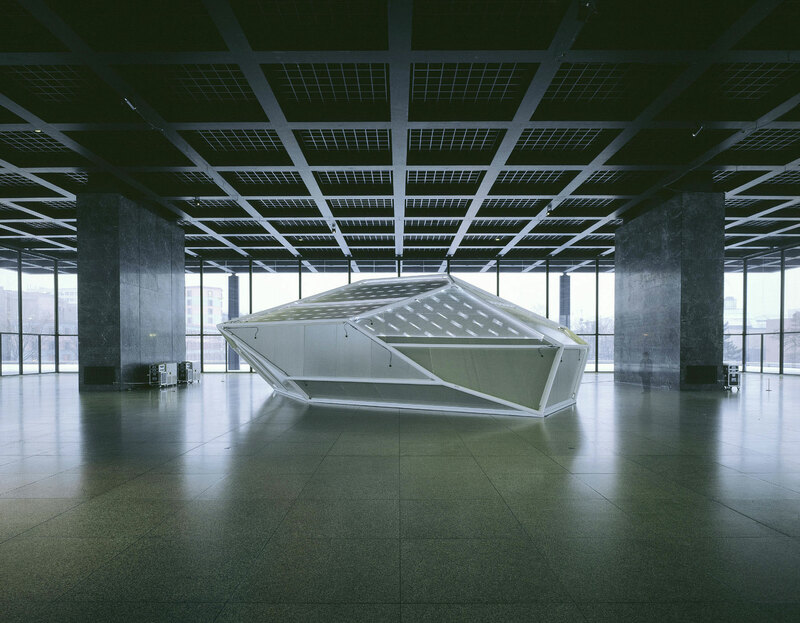 Carsten Nicolai, born 1965 in Chemnitz, has developed a special approach to the connection between art and music, between visual and acoustic perception, in his works since the mid-1990s. His stance as artist and musician may be compared with that of a researcher. In constantly new experimental arrangements, Nicolai seeks to overcome separations between human sensory experiences and to transform natural scientific phenomena, such as sound and light frequencies, into events perceptible for the eyes and ears. »syn chron« represents the largest project to date in Nicolai's endeavor to create a symbiosis between architecture, light and sound. The »syn chron« project takes place as part of the »Musical Works by Visual Artists« performance series, which Freunde Guter Musik Berlin has realized in collaboration with the Nationalgalerie Berlin since 1999 and, since 2002, with MaerzMusik festival of the Berliner Festspiele. 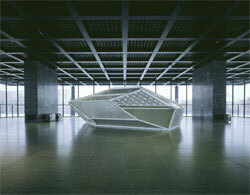 Within this series, Carsten Nicolai's work occupies a special position. It can be thought of as an experiment in which the artist is active not only at the border zones of art and music, but also at their interface with science. A project of Freunde Guter Musik Berlin e.V. and MaerzMusik 2005 Berliner Festspiele. Made possible by grants from the Ernst Schering Foundation and the Hauptstadtkulturfonds. With support from JENOPTIK AG, LaserAnimation SOLLINGER GmbH, ELAC Electroacustic GmbH and ideea Messe- und Dekorationsbau GmbH. Recommended by SPEX, supported by The Wire. With thanks to Galerie EIGEN + ART.